This way I will have web links with the default blue, and bookmark links with the cute dotted underline. This means I don't want to edit the default style. I want to apply a different style to some of the links. So I double-clicked on my "Reference" style and LO says the style has been applied. But however I look, nothing changed. How can I apply the custom style to my internal links? EDIT The problem has been solved by resetting the default Internet link style to Standard (see @ajlittoz 's answer), and creating two new styles : DocLink (black + dotted underline) and WebLink (blue + single underline). Did you forget to select the word(s) which are part of your link before applying your character style? @ajlittoz Nope, I even spent minutes re-applying said style over and over just to make sure. 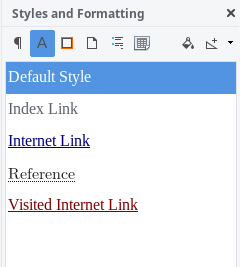 The "Styles and Formatting" panel highlights correctly my style when I select the link. When I put the cursor right after the link and write some more, the new text (not part of the link) has the right custom style. But it is never shown on the links. Good job writing the macro. For syntax highlighting on this site, single quotes ' must match, so add a ' to the end of each commented line as well as at the beginning. From my experiments, Internet Link does not behave as an ordinary character style: it seems to be an "internal" style which does not preclude others. As I understand it (I'm no developper and have not read yet any line of LO code), the style layers here are: character style, covered by Internet Link, partially covered by direct formatting (due to the "partial" effect, the correct ordering may be in fact: character style, direct formatting, Internet Link with standard overriding rules). As an exception to standard behaviour, two character styles can be assigned to a link: a user one and Internet Link. The latter is a consequence (or the cause) of the link property and can only be removed by right-click and Remove Hyperlink. If you need the hyperlink feature, you can't remove Internet Link but you can make profit of the double character style possibility to achieve different link appearance. In tab Font Effects, push the Standard button; this will reset all attributes to the state of Default Style, i.e. no change to current paragraph style. You can do the same if you want to override attributes in other tabs. OK to save your new defintion. Next, define as many character styles for your custom link appearance. Apply the desired custom character style to the link. It retains the link property from Internet Link and displays graphical attributes from your character style. I have not played with Visited Internet Link but the same trick should do. I don't know if this is a hack and will persist across updates to code base. Good point about the Standard button, which is much better than unzipping the file as suggested in my answer. Other than that, it sounds like we came to the same conclusion. Standard is not well described, if at all, and its importance/usefulness is highly underestimated. It saved my day more than once. Standard is exactly what I was looking for. Thanks! Apparently, trying to use a different hyperlink style that does not have underlines or use blue color does not work. It will not override the "Internet Link" style for these attributes. DIrect formatting can override the style, but you are right to avoid direct formatting. So let's do it the opposite way. Modify "Internet Link" and "Visited Internet Link" to look like "Default Style". This sounds easy, but it's actually the hard part. That's because removing the underline from within LibreOffice specifies "without underline" rather than leaving it unspecified. So instead, I unzipped the .odt file and edited styles.xml to remove these attributes from "Internet_20_link" and "Visited_20_Internet_20_link". Regarding the other part of the question, with this approach, it will be necessary to format each internet hyperlink to use the "Underlined Link" style. If there are a lot of them, you could automate this with a macro that sets the styles based on the HyperLinkURL property. I have lots of web links and bookmarks so I ended up writing a macro following your advice (see my updated question). Thanks! For Writer, bookmarks and web links are both "hyperlinks" and that's why they get the same character style. There is no way around to automate this, AFAIK. Your only option is to not use bookmarks at all but cross references instead. Then to the cross reference marker you can apply any character style. EDIT: as @ajlittoz says, you should be able to manually overwrite the character style, though. Sadly I can't use cross references either since I don't want to use fields for these links. Cross references don't allow me to reference e.g. "My Word" with the text "my words". I replied to Ajlittoz's comment. It may be an issue with my machine (an mild-old laptop running Fedora), I will try tomorrow on a Windows computer. how do I edit a hyperlink in impress?